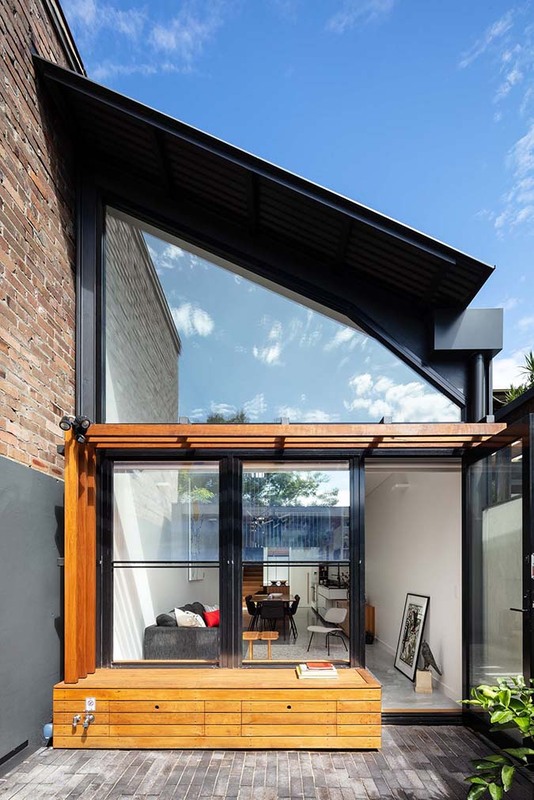 On Sunday 5 May 'At Home' visits 'Ferry Road' residence in Glebe, designed by Anderson Architecture. 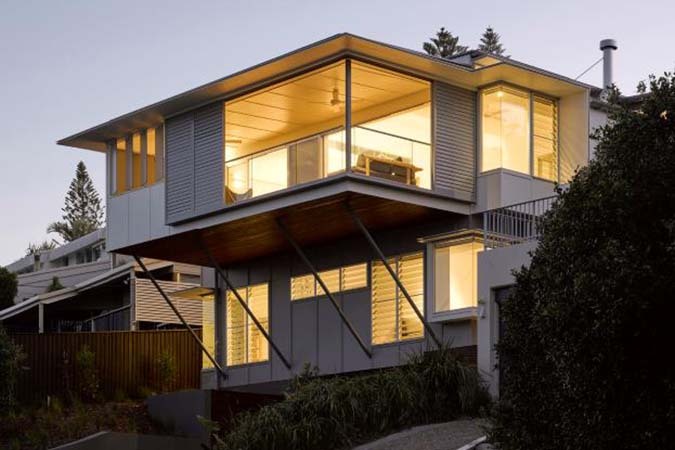 Simon Anderson, Principal of Anderson Architecture, will talk about the design process and lead you through this very sustainable home achieving an 8.0 Star rating. Born of a steep and narrow site, a yearning for lightness and space and a core design philosophy grounded in passive solar design and sustainability, this Glebe house is representative of how infill development within a heritage conservation area can be comfortable, practical and environmentally sensitive without compromise. A particular feature of the home is the central open staircase providing access from the ground floor to the first floor. The design of the stair allows for uninterrupted, through ventilation of the entirety of the ground and lower ground floors. The intricate design and detailing of this feature stair evidences the high quality results that may be achieved through the collaboration of design professionals with skilled tradespeople. For the clients, entertainers and connoisseurs of fine food, the kitchen was integral to the project brief. 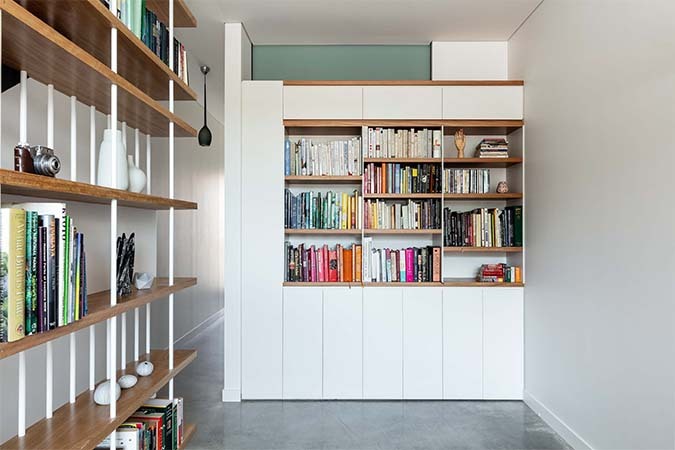 Appropriately, the kitchen was apportioned a large share of the lower ground footprint with a generous work space and spacious walk in butler’s pantry. High level windows above, and sculptural roof articulation open up to create an immense sense of space above the living areas within the home’s comparably small footprint. Simon Anderson established his architecture practice, Anderson Architecture in 2002. 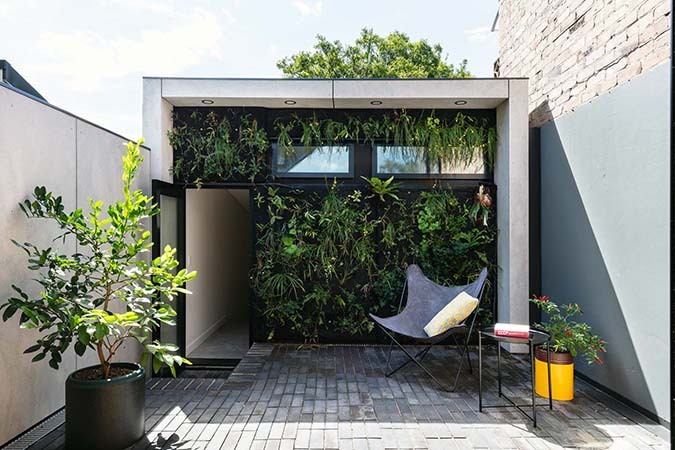 The small studio, operating out of Surry Hills, specialises in residential architecture. Their approach towards design is about creating connections between the natural and the built environment – with an emphasis on humane design and a priority on natural light and tactile materials, to bring projects to life. The firms body of work is driven by the principles of passive design, along with active systems to reduce energy use. They utilise computer thermal modelling to engage clients and give them feedback about heating, cooling, glazing and insulation. Anderson Architecture has been recognised by the design and construction industry through awards for sustainable design and in judging sustainable resilient architecture. 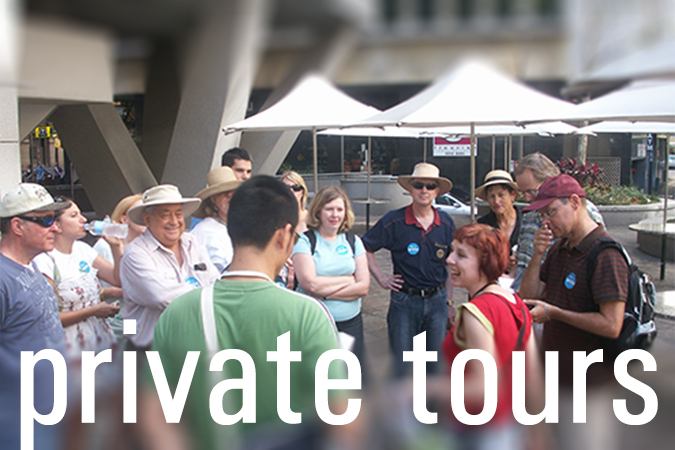 Don't miss out on securing your tickets for one of the Australian Architecture Association's most popular tours - the AAA Sunshine Coast Residential Coach Tour. 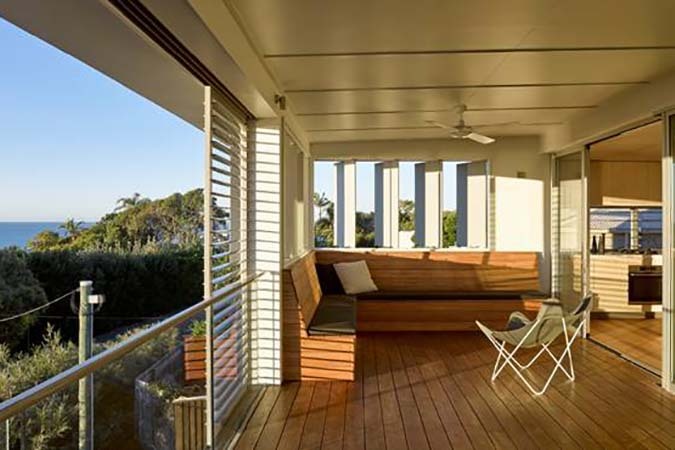 Taking place Saturday 17 August, this years tour promises to provide another fascinating insight into the latest contemporary home design in Queensland. 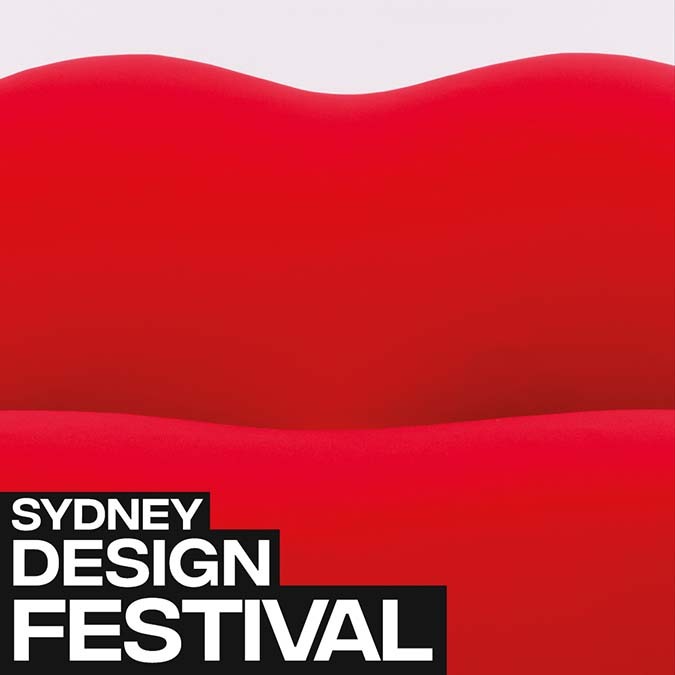 Once again the Australian Architecture Association will showcase the work of the latest upcoming Queensland architects, along with past tour favourites, such as Bark Design Architects, Robinson Architects and John Mainwaring. A full lunch is provided on the day of the bus tour. The AAA recommends you book your accommodation in Noosa and flights early. When arranging departures - The AAA recommends that you book an evening flight on Sunday so you'll have time to explore the delights of the region. Numbers are limited, so book now! On Sunday 31 March 'At Home' visits the 'Sugarloaf House' in Castlecrag, designed by Ellen Woolley Architects. Designed for a family and their menagerie of pets, the Castlecrag home has been carefully designed to work to the contraints of the sites challenging topography and surrounding environment. It sits on a narrow platform, between two close coupled cliffs front and back, and is further penned in on both sides by long large houses. The first cliff is just behind the front street boundary. The second cliff, to their rear garden and beyond, is to the bushland. This communal backyard slips down to a small creek and onto Harold Reid Reserve’s stunning lower north shore ecology. In the centre of their garden sits a monumental Angophora, surrounded by the daily work of the owner, a local bee keeper. 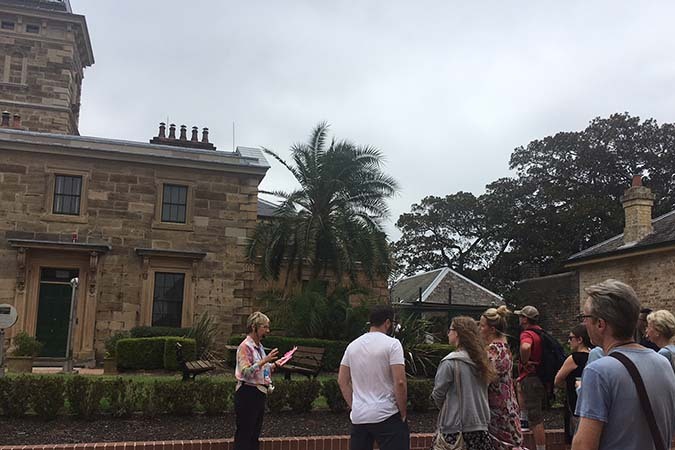 First it offers both a green plateau (roof garden) that reveals Harold Reid’s bushland. Second it carves out a central void down to the sandstone bedrock heart that is the narrow platform the house sits on, allowing the passer-by to connect from the earth, to the framed Angophora beyond and up to the sky through the house’s heart. This can be screened at the owners’ discretion for greater privacy. So there is a spatial flow created through the heart of the home, onto its natural bedrock base and out to the bushland. This does two things. 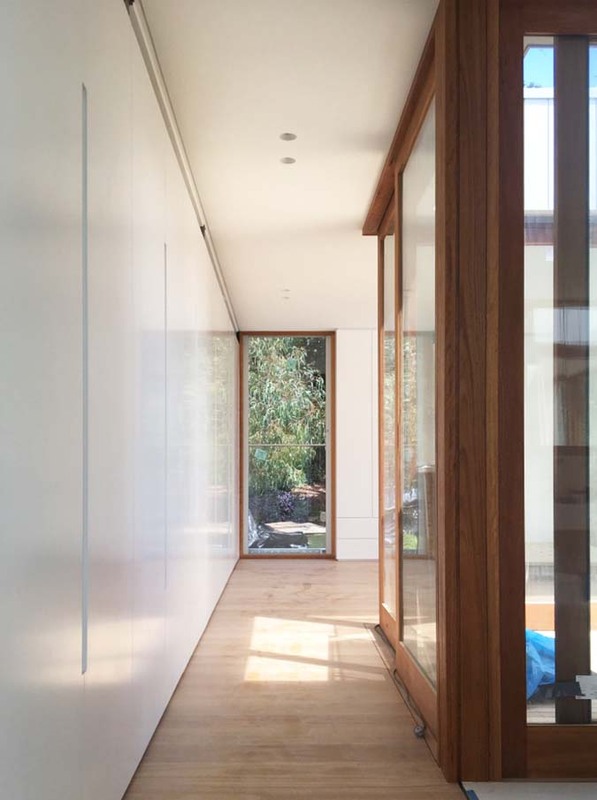 It directly connects us to the natural context, but it also allows for central ‘landscape room’ focus with the house being able to ‘turn its back’ to the two side boundaries and create a private light filled oasis for every inhabited room (bar the ‘bee’ one that necessitates complete removal). And so whilst the house on one hand is centexturally responsible, it has concurrently a very intimate and private interior. These co-exiting intents unite in the aim to ameliorate and even improve our interference with nature and tries to better connect us to this remarkable ecology and landscape in a more mindful way. The construction is essentially two giant ‘esky’ pavilions (polyisocyanurate) clad in long life thermal mass (concrete), with literally the bedrock earth in the middle. The stair folds, like filigree, across this void. Ellen Woolley established her private practice, Ellen Woolley Architects in the early 2000s. 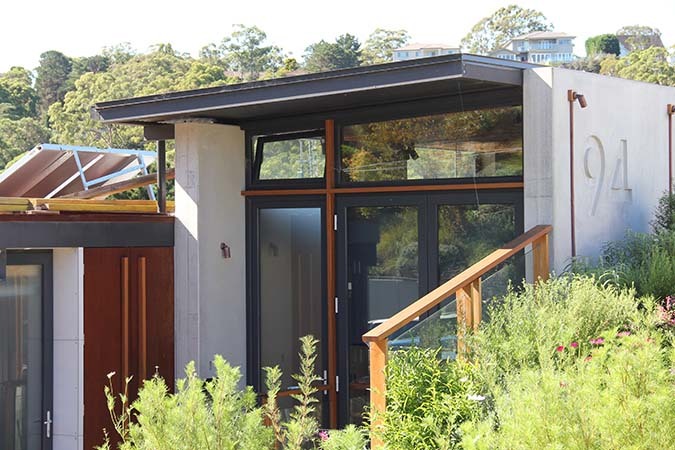 The small studio, operating out of Castlecrag, specialises in residential architecture. 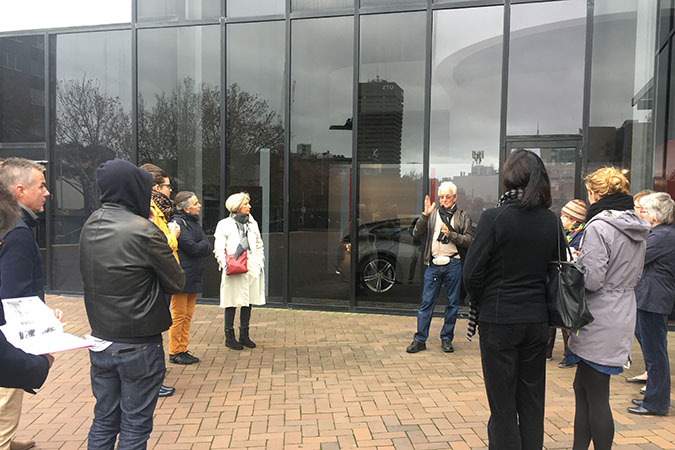 Their projects are often found on challenging sites, working with bushfire, extreme topographies, environmental conservation, sustainability and heritage. 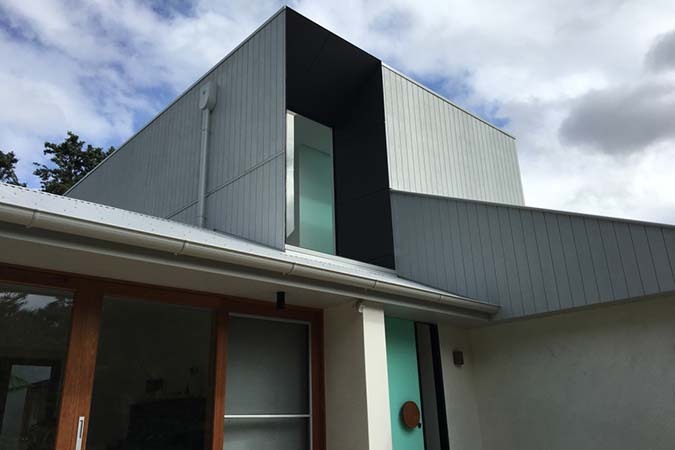 The practices portfolio of single homes and alterations and additions, has been recognised through industry awards and has been featured in published anthologies on Australian Architecture and digital publications. 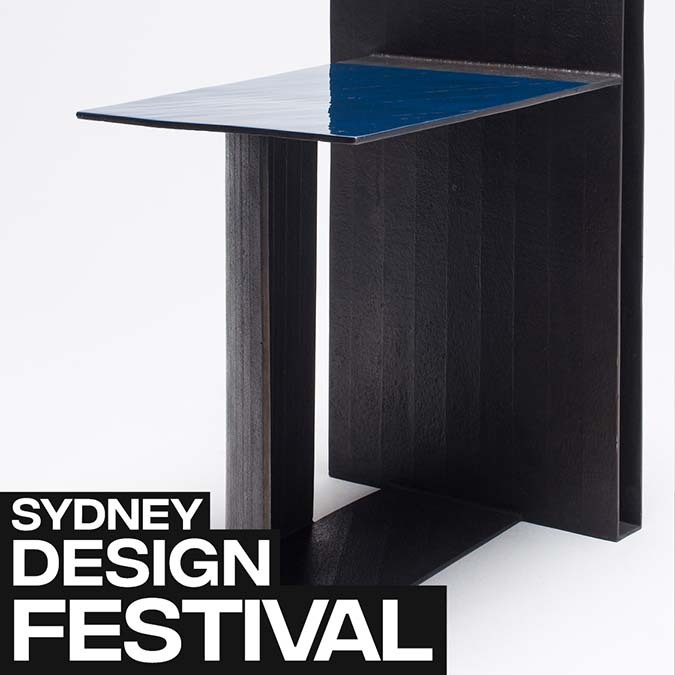 Ellen is also an active member of the Australian architecture community, taking part as a juror in NSW Institute of Architecture awards and as a writer about architects and architecture in publications such as ArchitectureNow.